Version 2.18 is now posted at lotrointerface. You can now change the icon of any slot to look like one of your skill icons (or any other icon if you know its Asset ID, which you can find with Asset Browser or IRV). Added a new kind of special slot: Delay. This is useful if you want to put a conditional immediately after a slot that takes some time to execute. Changed the cursor movement behavior. Previously if you clicked somewhere in the sequence before the currently selected item, the cursor would not move. Now, the cursor will always move to the position in the bar that you clicked on. This was done to simplify the code, which is getting way too complex. Removed the "Reset bar at startup" event behavior. Bars are always reset at startup, so this is redundant. Improved the "Advance when item equipped" feature. Previously the sequence would not advance if the item was already equipped when you clicked it. It will now advance if the item is already equipped. Caveat: The plugin cannot distinguish between two different items of the same name. When you create a special slot in the sequence editor, it now inserts the new slot rather than replacing the selected slot. Version 2.19 is now posted at lotrointerface. Added "Reset bar when trait tree changes" and "Reset group when trait tree changes" event behaviors. Improved cleanup when the plugin is unloaded. The plugin will take longer to unload, but it may improve stability of the game client after the plugin is reloaded multiple times. Version 2.20 is now posted at lotrointerface. Fixed a problem with nested conditionals that could cause stack overflow. Added a "reset" icon that will appear if no other slots are being displayed, rather than just an empty cursor. Performance improvement: Slot folding evaluations are now cached and reused until the game time advances. Can we just install this one over the existing one? Want to make sure we will not have any issues. Yes. Or you can use Plugin Compendium to keep up-to-date. It looks like my stack bug fix didn't completely fix the stack overflow problem (apparently it can still happen) so I'll be posting a new version when I figure it out. Thanks for the reply. Will wait for the update then. Version 2.21 is now posted at lotrointerface. Second attempt to fix the stack overflow issue. There was a bug that could manifest only in cases where all of the conditional slots were "automatic" and the conditions resulted in no non-automatic slots being displayed. is it possible to add keybindings to these bars? i suppose not but hopefully im missing something. Version 2.22 is now posted at lotrointerface. Fixed a bug that generated the error message "attempt to compare number with nil" when loading the plugin. Please see this comment and let me know if you have further questions. Currently, you can only do it by dedicating one of your slots on your main quickslot bars to a chat command. ah thats not what i was looking for. basically i want to press „1“ instead of clicking to go through the sequence. That functionality isn't possible for me to implement, due to limitations imposed intentionally by Turbine. "<path to plugins>\SequenceEditor.lua:74 6: attempt to call method 'GetSkillInfo' (a nil value)". I hope you can spare the time to look into this - thanks. Thanks for reporting the problem. I've sent you a PM with some questions and troubleshooting steps. It's now posted at lotrointerface. Fixed a bug (reported by fade2gray above) that prevented "Skill is trained" conditionals from working correctly with non-level-capped characters. Version 2.24 is now posted at lotrointerface. Added the ability to test the "Hunter Focus" value in conditionals (thanks, fade2gray). Added support for the new emote shortcuts appearing in the Collections panel. I've been trying to find solutions to a few issues I've been experiencing with SequenceBars. Unknowingly, whilst making repeated changes, I managed to make the dropdown skill list incredibly long causing game performance to slow down. I believe the cache only gets reset if the character is logged out or the game exited. I haven't noticed (yet) if the above changes breaks anything. At my current Hunter level (28) I obviously have trained and untrained skills and there are several skills that have an "Improved" version. One such skill pair is 'Penetrating Shot'/'Improved Penetrating Shot'. If I select 'Penetrating Shot' as the parameter for 'IF Skill is/not Ready/Trained' and then move the cursor out of and back into the list, the selected skill will change to the Improved version but still acts as if the un-Improved version was in effect (I haven't trained any of the Improved skills yet so am unable to test what difference that might make). This behaviour is in effect regardless of any code changes made in point #1 above, and a solution is beyond my level of competence to figure out. The thing is, why are trained/untrained skills listed together? As an example, if an untrained skill is selected as the conditional parameter for 'If Skill is Ready', logically the condition could never be true. Yeah, looks like a bug. I'll look into it. I think I've found a fix for 2/3 above (at lest for my Hunter) in that if 'if skill is/not ready' or 'if skill is trained' is selected then only trained skills are listed, and if 'if skill not trained' is selected only untrained skills are listed, but I don't think it will fix the issue with the Improved skill versions once they've been trained. My Turbine/LUA coding knowledge is absolutely minimal, so any changes I've made could probably be improved on. I identified and fixed (in a slightly different way than you) the problem with the iteratively growing skills list. I also changed it so for the "Skill is ready" condition it will only list the trained skills, per your suggestion. The problem with "improved" skills is that my code currently uses the skill's icon to identify a skill, not its name. This was so it would continue to work if you change client languages. However, I didn't take into account the possibility that more than one skill could use the same icon. There are already other things that will break (e.g. the "Effect is present" condition) if you change client languages, though. I so guess I won't be losing much if I identify skills by their names rather than their icons. I will implement this change (along with the tedious chore of supporting backward compatibility with old settings files) and upload a new version soon. It looks like in some cases, the "improved" version of a skill uses a different icon, but in other cases the devs got lazy and reused the same icon. If the icons are different, then the current system (distinguishing skills by their icons) works fine. Question: Is it possible to have more than one skill trained that uses the same icon? I think not (i.e. the "improved" version always replaces the unimproved version, AFAIK). If that's the case, then I can still use the icon IDs for purposes of the "Skill is ready" conditional, and I only need to use the skill name in the "Skill is trained" conditional. Version 2.25 is now posted at lotrointerface. For some conditionals, if you accepted the default value in the pulldown menu, the argument value wasn't stored correctly. When editing a "Skill is/not ready" or "Skill is/not trained" conditional, the list of skills in the pulldown menu contained duplicate entries in some circumstances (described by fade2gray above). The "Skill not ready" condition didn't actually test skill readiness; instead it tested whether a skill was trained (i.e. it implemented the "Skill not trained" condition). The "Skill trained" condition didn't actually whether the skill was trained; instead it tested whether a skill was ready (i.e. it implemented the "Skill ready" condition). 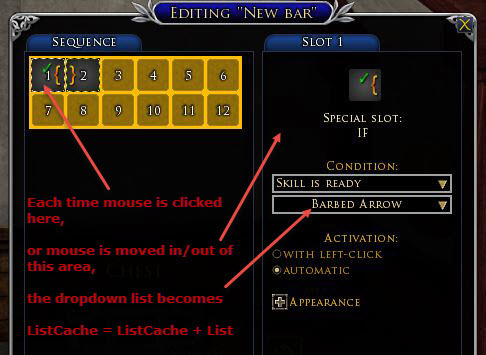 When editing a "Skill is/not ready" conditional in the Sequence Editor, untrained skills will no longer be shown in the list.